I study, test and review business technology for a living. To most people, this is the most boring topic imaginable. In fact, it is so boring that when people ask me what I do, I typically make something up or try to change the subject. It is so boring that my father literally falls asleep when I start talking about work- even when he is the only other person in the room. Fortunately for me, people NEED information about business technology at certain moments in their lives. For those people, in those moments, I am the most interesting man in the world. So if you are someone that happens to be in the process of starting a business, moving into a new office or upgrading your business’s phone system, I have some exciting information for you. Cloud phone systems are cool. Having an office equipped with a professional phone system and high quality phones is useful both functionally and from the feeling of professionalism that it brings to your work environment. In the past, you used to have to purchase thousands of dollars of hardware, employ an IT professional to install and maintain this equipment and pay your local telecom for phone lines. “Cloud phones” (aka: cloud-based business VoIP or just “business VoIP“)eliminate the need for all of this. You sign up with one company that provides you the phone lines and the phones, and you don’t need any of the additional hardware. These phones have all the features of a full business phone system, and they can be managed by anyone (no IT experience required) through a website. Furthermore, if you move offices, or even just decide you want to work from home (or anywhere for that matter), you can just take the phone with you, plug into an Internet connection and Boom, your phone works! Quick side note: the rest of the industry calls “cloud phones,” “cloud-based business voip phone systems.” The only worse branding I’ve ever seen was the name of my first “smartphone,” Sprint’s PPC-6700. The guy who named that must have been fired. I call these “cloud phones,” because it sounds better. How Do “Cloud Phones” Work? Anyway, these “cloud phones” are pretty incredible. First of all, once you’ve signed up, the phones simply show up in the mail ready to go. You just plug them into a live Internet connection and, vioala, you and all your employees have a dial tone. Second, these phones are designed to integrate with the smartphone that you probably use for business about half the time anyway. You can easily setup up your calls to forward to your mobile number or ring it simultaneously with your desk phone. They also have apps that you can use to see your call log, voicemail, faxes (if you do that sort of thing) as well as manage your voicemail settings, call hours (so your phone goes straight to voicemail if someone calls in the middle of the night), etc. I pretty much never remember to change my voicemail when I go out of town, but I can use the app to update it from the car on the way to the airport. How Much Do “Cloud Phones” Cost? One thing that cloud phones sadly have in common with their predecessors is confusing taxes and fees that you don’t really see until after you’ve already signed up. These fees wind up increasing the price between 20 and 40%, so my colleagues and I decided to build a price comparison tool that estimates bottom line pricing INCLUDING TAXES AND FEES. I do want to say that I couldn’t have built this tool without the cooperation of Nextiva, RingCentral, Jive and Phone.com. These companies willingly shared their back-end pricing information with us, which I think says a lot about the integrity and honesty of these companies. Bottom line, if you happen to be one of those people who are hanging on every word of this article, because you are currently in need of phones for your business, you will really be happy when you use this cloud phone price comparison tool. For anyone who isn’t in that market, I can’t imagine why you’re still reading this. If you are, please comment with why you bothered. I promise to comment back. VoIP phones have come a long way since 2007. 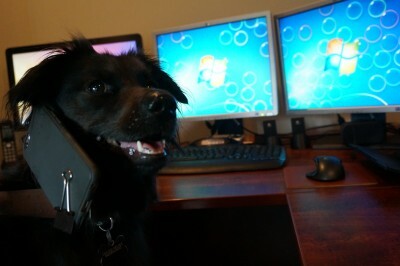 When we started testing business VoIP services in 2009, they still had too many quality issues to take them seriously. However, we continued to monitor the services, and in 2011, we actually switched our own traditional landlines to a cloud-based VoIP system and were very happy with the quality. It’s been over 4 years since then and the quality has continued to make huge strides. One interesting fact: even though you may not realize it, companies like AT&T will give you a VoIP line unless you specifically request analog. I read this article mainly because I’m your sister and because I’m so familiar with the personal commentary you use (e.g.inconsiderate father) to help liven up your discussion about business phones. That’s what pulled me in initially, but I have to compliment you on your writing in general. Exceedingly to-the-point!